Around 2,000 Philadelphia union workers gathered on Penn’s Landing on Wednesday 15th August to protest President Trump’s immigration policies, including the separation of asylum-seeking families and the denial of parole applications by immigrants awaiting case resolution. ICE officers in the Philadelphia branch arrest more undocumented non-criminal immigrants than in any other city. Union protesters chose the city because the ICE office here has denied all parole applications from asylum seekers awaiting their case’s resolution. Mayor Jim Kenney, who in late July announced the city would not renew its criminal records sharing agreement with the federal Immigration and Customs Enforcement agency, took the stage in support. Donald Trump claimed during his presidential campaign that reducing the number of immigrants would result in higher wages and greater opportunities for the rest of us Nothing can be farther from the truth. However the facts haven’t stopped this administration from attacking immigrant workers and their families. Immigration raids have increased by 42% since Trump took office – targeting immigrant workers regardless of whether they committed a crime. If you’re an immigrant, you can be jailed just for showing up to work. In workplaces across the country, corrupt employers are capitalizing on this fear, which drives down standards for everyone. Fear mongering aimed at bullying workers has a chilling effect on all workers in the building trades, not just recent immigrants. Now more than ever we need strong unions to fight back against the inhumane and ineffective immigration policies that create a climate of terror at the workplace, criminalize workers and endanger our future. The big Canadian story so far this year is the decision by Unifor, the country’s largest private sector union, to leave the Canadian Labour Congress or CLC, the national labour centre. The decision has sent shockwaves through all unions and it threatens not just national programmes but co-ordination between unions at the regional and local levels. Splits in national labour movements are far from unknown. In some countries longstanding ideological differences have meant that multiple national labour bodies are the norm as with Poland or India. In the USA and South Africa splits over fundamental political or programmatic positions are more recent. Other than a few years in the 1990s when the building trades unions formed the Canadian Federation of Labour, the Canadian movement has been united since 1956 when two rival centres merged. 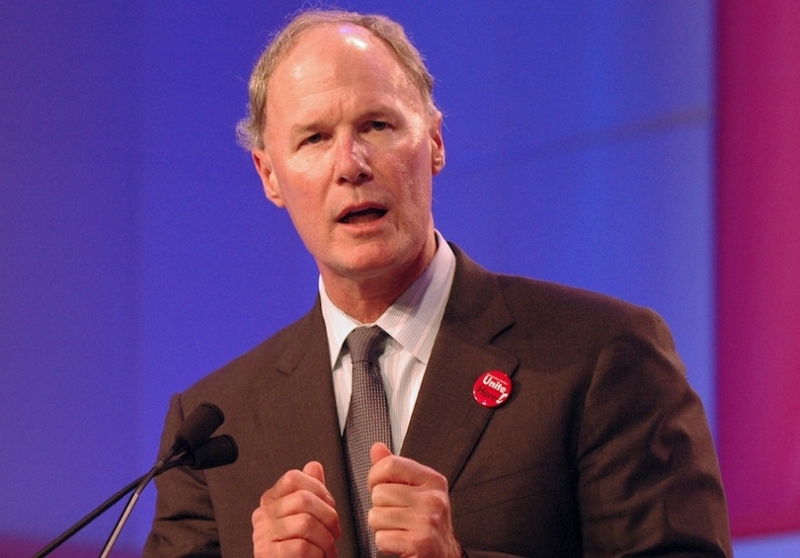 Unifor is the product of a series of mergers between unions dating back decades. Most of the predecessor unions were the result of splits from an American parent union. In the private sector most unions were and many still are sections of unions based in the USA. The largest of Unifor’s predecessor unions, the Canadian Autoworkers or CAW, was formed when Canadian workers resisted the concessions that had been agreed-to by the UAW in bargaining with the large American car makers on both sides of the border. Nationalism and a commitment to the creation of Canadian unions runs deep in Unifor culture. Moves by Unifor to assist leaders of large local unions in taking their members out of US-based unions created considerable conflict within the leadership of the CLC. Unifor sees its actions as supporting the right of workers to freely choose their union. Opponents point to the CLC’s existing process by which unhappy workers can move from one union to another and attribute Unifor’s frustration to its inability to make gains in membership using that process. 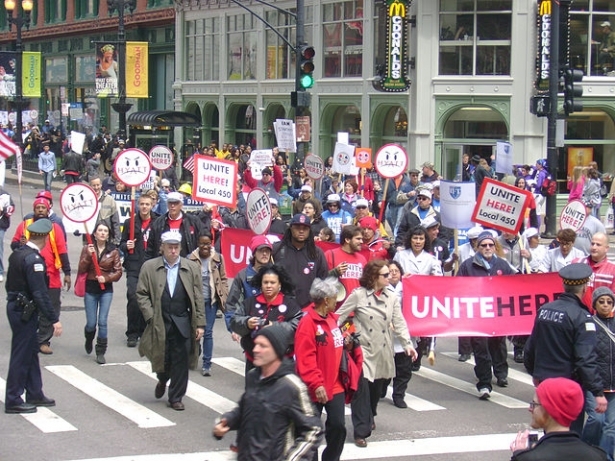 Union activists are deeply worried that fighting over already organized workers will waste resources and serves as a distraction from the movement’s real task: organizing the unorganized. On 16 January Unifor’s executive made the decision to leave the CLC, promising not to damage solidarity at the local level where unions co-ordinate national mass campaigns. Several of these are under way at the moment and were, until recently, considered great successes, including one in support of coffee shop workers (see HERE for more). Unifor explains its reasons for leaving the CLC HERE. Within hours of the announcement Unifor, in concert with hotel union dissidents, began raiding workers who are currently members of UNITE-HERE, a US-based union. At this point the Unifor campaign is having considerable success. Leadership reaction to the split varies by union. They range from attacks on Unifor to appeals for unification talks. Activists across the country are expressing concern about Unifor’s motives and goals. Cross-union caucuses and local Labour Councils (where activists from different unions co-ordinate local activities) are working to ensure effective solidarity despite the split. See HERE for an example of the rank-and-file reaction and HERE for the reaction of the President of the Toronto Labour Council, the country’s largest. The Canadian sections of what in North America are called international unions are turning inward and focusing on preparing their members for an approach by Unifor, on defending from a loss in membership. Canada-only unions, referred-to as national unions, appear to be largely unconcerned about direct confrontations with Unifor. Local Labour Councils and provincial Federations of Labour are working to minimize the impact, sometimes not knowing if the Unifor members elected to lead them are still eligible to do so. LabourStart Canada will continue to follow this story as it develops and you can too by visiting the LabourStart Canadian news page or by following our Twitter feeds in both of Canada’s official languages: @LabourStartCanE for stories in English and @LabourStartCanF for stories in French. This special report is reposted from LabourStart. Look for the LabourStart table at the upcoming Labor Notes Conference in Chicago. Since President Obama signed the Affordable Care Act (ACA) into law in 2010, unions say they have pleaded with the White House dozens of times to make labor-friendly changes to the law. With the deadline to sign up for 2014 coverage looming, hospitality union Unite Here has produced a stinging new report on the failure of the White House and congressional Democrats to face Obamacare’s numerous problems. Ethical Eaters of The World Unite…For Workers Rights No Unions Behind The Kitchen Door? Last year’s multi-city protests by fast food workers focused long overdue attention on the job problems of ten million Americans employed in restaurants. Saru Jayaraman, the charismatic co-founder of Restaurant Opportunities Centers United (ROC), has been assisting workers in finer dining establishments for more than a decade, an organizing career impressively chronicled in her new book, Behind The Kitchen Door, from Cornell University Press. Jayaraman is a Yale-educated lawyer who directs the Food Labor Research Center at the University of California, Berkeley. She got her start, with much help from UNITE-HERE Local 100, after the 9/11 attacks destroyed Windows on the World, a swank New York City restaurant that sat atop one of the Trade Center towers. 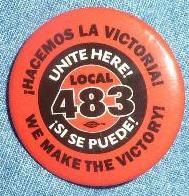 Seventy-three workers died and 250 lost their jobs. Windows workers became the nucleus of the original ROC, which provided support services for families of the deceased. A widely heralded union peace agreement that would end a global boycott of Hyatt Hotels Corp and usher in a new era of better labor relations at the sprawling lodgings chain is hitting some potholes on the road to completion, but both sides are still expressing confidence in its ultimate success. UNITE HERE, the union of U.S. and Canadian hotel workers, and the Hyatt chain announced a wide-reaching agreement on Monday afternoon that will give Hyatt employees in currently non-union hotels across the nation the right to choose a union without having to face management opposition. In return, UNITE HERE announced it is lifting its global boycott of Hyatt hotels. The agreement will go into effect when new union contracts for current members are ratified by UNITE HERE locals in San Francisco, Los Angeles, Chicago, and Honolulu. The terms of those contracts were also agreed to in today’s settlement. Over the past quarter-century, UNITE HERE has significantly raised living standards for its members in cities where most major hotels have union contracts. In New York, San Francisco and Las Vegas, hotel workers make more than $20-an-hour with employer-provided health benefit plans that have won national acclaim. The union is also known for its innovative contracts: In Las Vegas, the hotels fund and hire from a “Culinary Academy” that trains and certifies graduates for jobs ranging from fry cook to sommelier. In Los Angeles, since the 1990s, the hotels ensure that any employees deported by U.S. Immigrations and Customs Enforcement can regain their jobs if they return within two years. The Demerger of UNITE HERE: Worse than a Messy Divorce?